Hello again! And all the best to you for 2016. 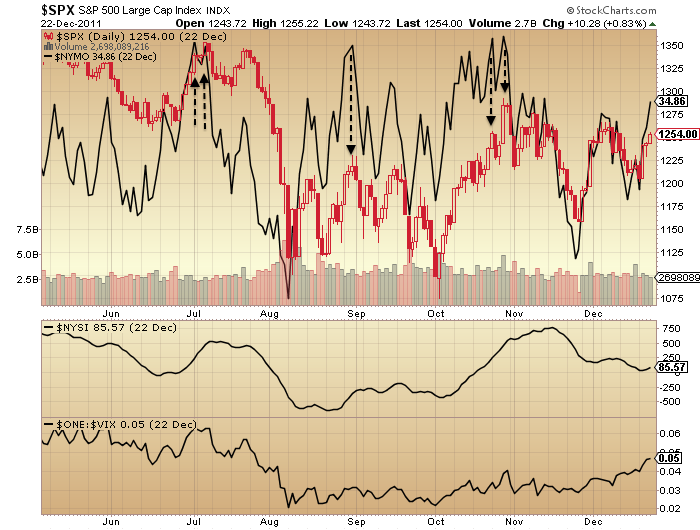 Markets moving closer to validation: the completion of a major top in equities, and the resurgence of gold. It has been a long and difficult 2 year major topping process in the stock market, but a topping process it indeed appears to have been. Here are the updated charts. OK, I have decided to revamp the site with a focus on the longer term and big global macro, as that is my ‘USP’. So be aware you might visit and see some construction work in progress. It will mean less frequent posts as the big picture doesn’t move so fast, but that suits me, and hopefully you will approve of the changes. Self-explanatory I believe, so no comments. 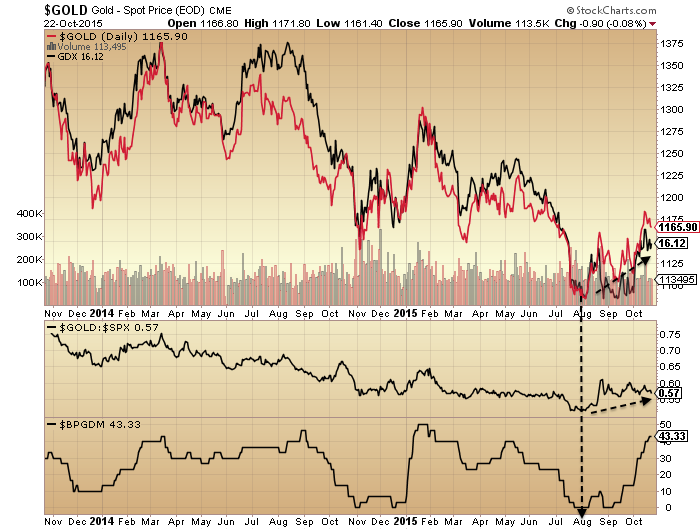 Clear interest in physical gold and silver which suggests the turn should be near. For stocks it comes down to the short term waves within the overall picture of a major top. I can’t rule out a Xmas rally and no fresh falls until Jan, which would mean the US large cap indices all hit new highs (whilst not invalidating the bear). But I think the probability lies with this having been the second/retrace wave of a bear and that we tip over as soon as this coming week. Let’s see. Have a good week. The only exception in the last 20 years was 2011. The 200MA turned downwards, the market was repelled but shortly afterwards bounced again and burst back through. 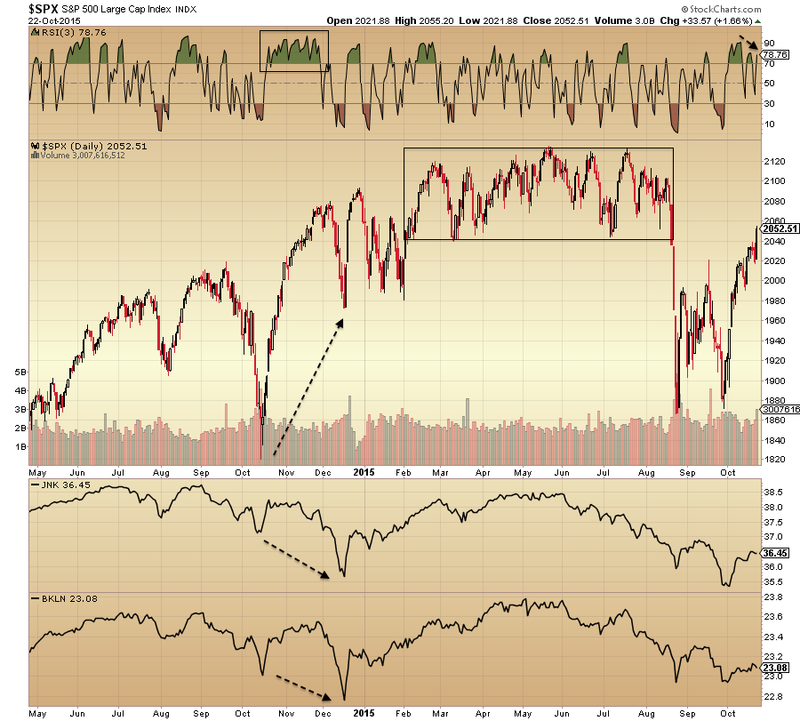 The SP500 didn’t break out of what could be a large rounded arc top. 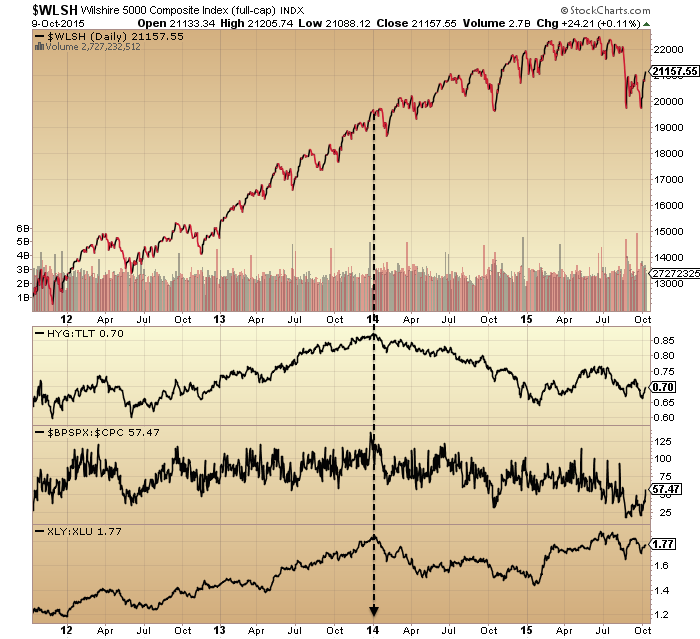 Breadth and volatility continue to show long negative divergences like into the 2007 peak. 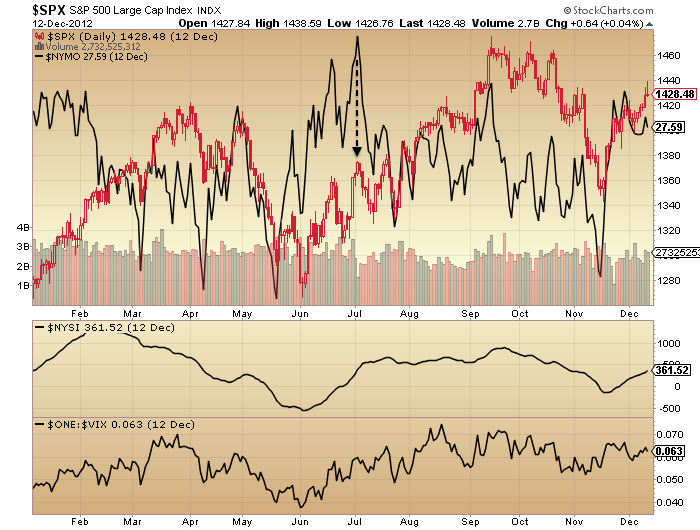 We can see 2011 wasn’t the same: full breadth into the peak and not the same complacency. Risk and other major indices are still flagging. So I still think we are at the equivalent yellow circle, until all these indicators start to behave otherwise. Failing that, then the yellow circle above back in 2008 or a similar point in 2000 saw more back and forth in an overall downtrend. Either way, the key would be that we don’t revisit the early November high again. The solunar model shows a decline into late November before a bounce. Of the near term indicators, $CPCE has reached a level that could suggest a bounce here. But note how the boxed range shifted higher since July which could mean $CPCE goes higher yet. Insider action has reverted to the buy zone. 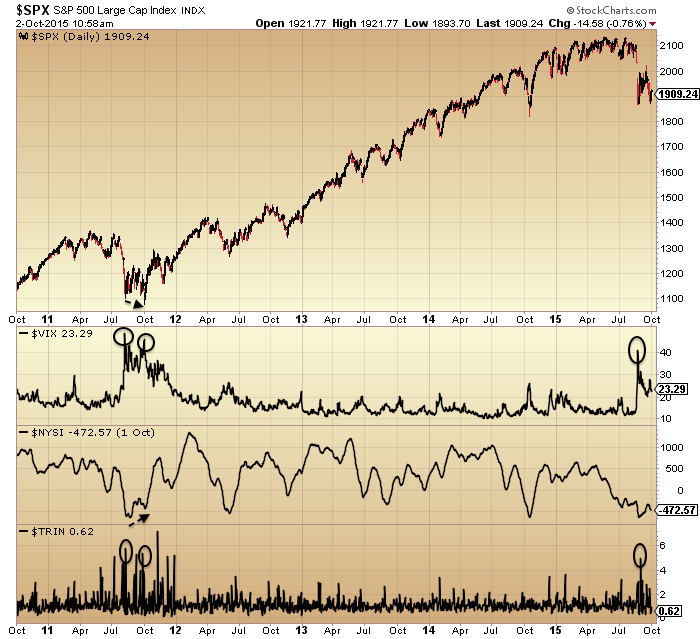 Both 1998 and 2011 saw a second (or more) $TRIN spike (fear capitulation) which hasn’t occurred in 2015. It doesn’t have to, but just one more potential clue. 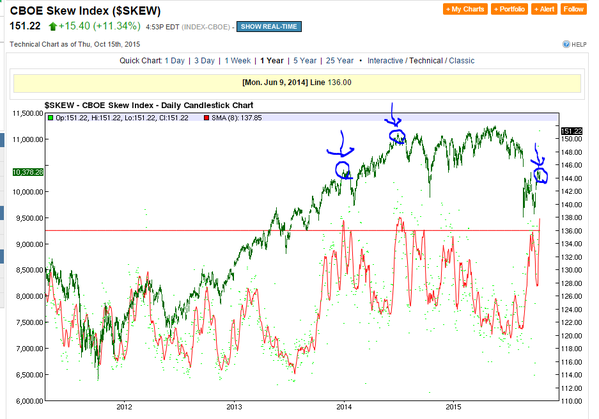 $SKEW remains particularly elevated. It doesn’t have a great track record of calling the outsized move that it is supposed to predict, but again, it may be a clue. Economic data remains weak but mixed. The overall global situation is fragile, and I maintain just the stock market, with its wealth effect, is keeping disaster at bay – for now. Then we have a series of anomalies occurring in the financial markets which may collectively spell liquidity troubles. 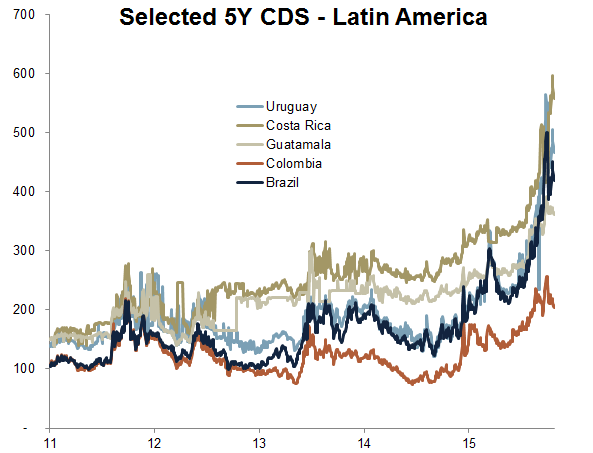 Corporate bond inventories have gone negative, repo rates are fractured, swap spreads have gone negative. These are fairly unprecedented so no-one seems to quite know what they mean, but given the distortions that have built up under ZIRP and QE we shouldn’t be surprised if another systemic crisis was to start to take hold in some area. Lastly, gold still looks like it may need a final washout low, due to open positioning and put call ratios. My guess is we see the US dollar break out and take off again here, as a bearish development for the overall markets, and gold gets its final sell off in response, before breaking into its new cyclical bull, as equities move decisively into full bear market. It has been a strong, unforgiving, bullish rally – but – only in select US large caps. For the Dow Jones World index, junk bonds, Biotech and US small caps index the action better resembles a dead cat bounce. The FTSE, HSI and crude oil similarly show weak bounces. Here we see it looks much stronger on US large caps, but even there under the hood breadth has remained in weak longer term downtrends. The NDX has double topped but on just half breadth. Therefore, even in the stronger US large caps, longs are doing well only in select stocks. Another angle on the same is the equally weighted value line index which shows a particularly meagre rally. 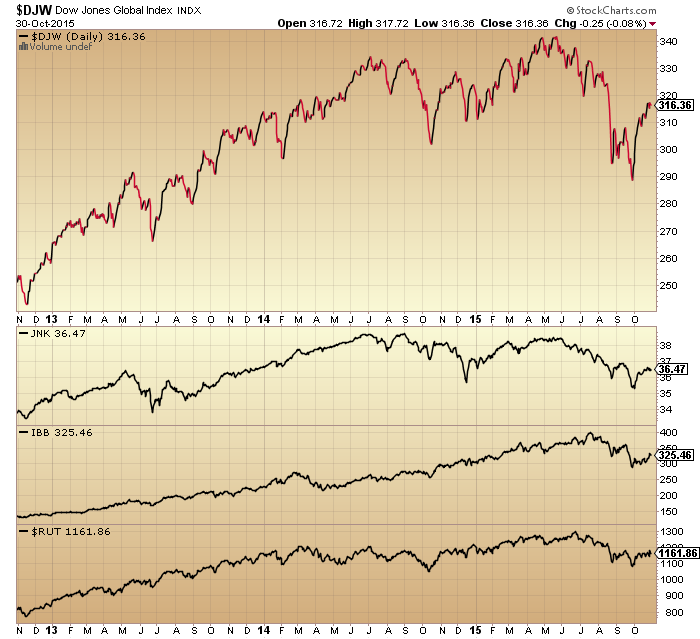 In short, the ‘strong’ rally in October has seen the thinnest participation yet in both the US and globally. The model of similar solar lunar years from the past predicted a rally throughout October to the start of November. Now we are at that point, various indicators which had become particularly bearish (contrarian bullish) have now reversed back. Therefore, we may be in a position to rollover again imminently and maintain the bear market in equities. However, there is little wiggle room. 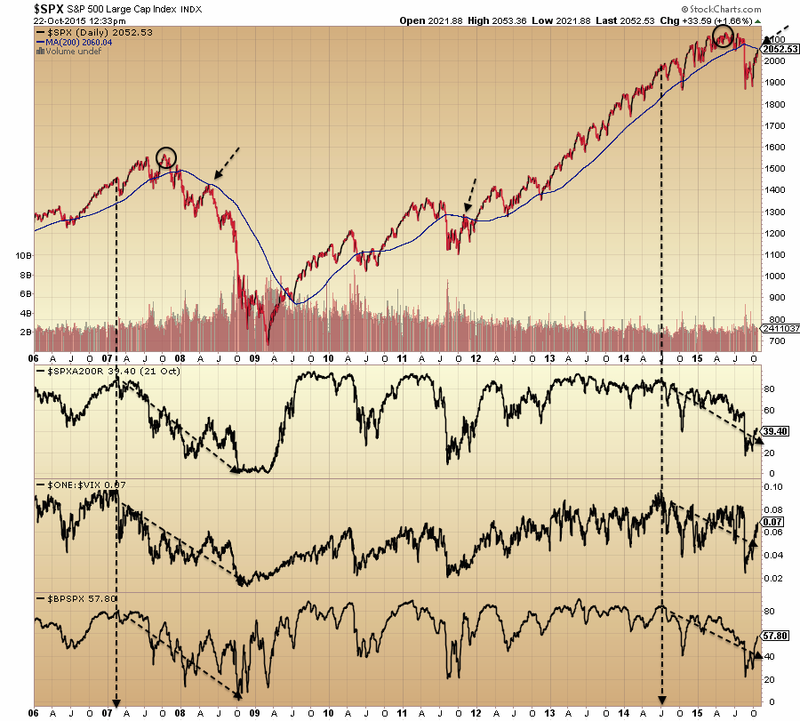 The SP500 is back at the major topping arc. If strength persists from here, even in just select large caps, then this would break upwards beyond the arc, the NDX would make a new high, and the danger then would be that the other weaker indices start to attract a bid again. For now though, the opposite holds. The persistent weakness in all areas beyond select US large caps suggests they are the last pillar to fall. Continued weakness in economic surprises, ECRI leading indicators, narrow money leading indicators and earnings (less negative than expected for Q3 but still negative, and still predicted negative for Q4) provides no thrust for a renewed move higher. Meanwhile, negative feedback looping around the world persists and until we see a break in that pattern then the likelihood remains of both bear market and recession, globally. Still the bulls have the ball, and still we can’t say for sure whether we are in a bear or a bull market. Bullish percent, volatility and breadth still make this look like a bear market rally. 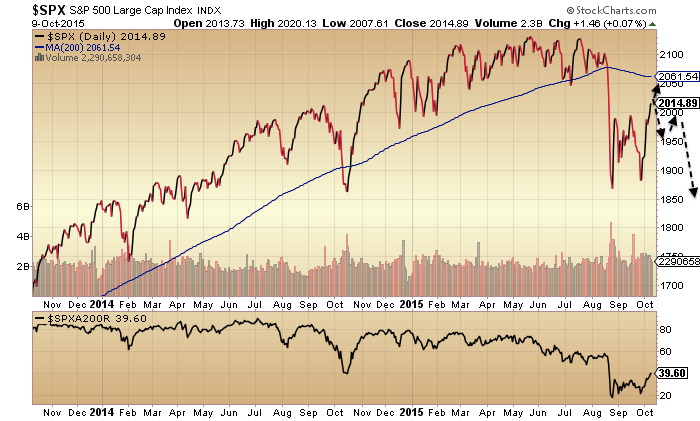 The SP500 is at the 200MA. If this is a bear then it would be normal to be repelled here, making this the ideal second chance peak to short. If this is a bull then we might still expect a pullback like in 2011 before breaking back above the 200MA again. If instead equities power directly upwards back to the highs, then it would be another thrust like in October 2014. Here we see that it is US large caps which are looking particularly bullish, whereas US small caps, junk bonds and the FTSE (and most other indices) all look more bearish. However, note how in Q4 2014 junk bonds and leveraged loans diverged negatively but turned out to be a false signal as they ultimately recovered once stocks were more cemented in new highs. That chart also shows that the rally this Oct has not been as impulsive as last Oct, with the RSI showing a negative divergence and not being stuck in the green. Additionally, the chart shows the 6 month range of 2015 (boxed). Anyone who bought in that period is underwater and this should create supply from above with price now back at the bottom of that range. Here we see NAAIM manager exposure. 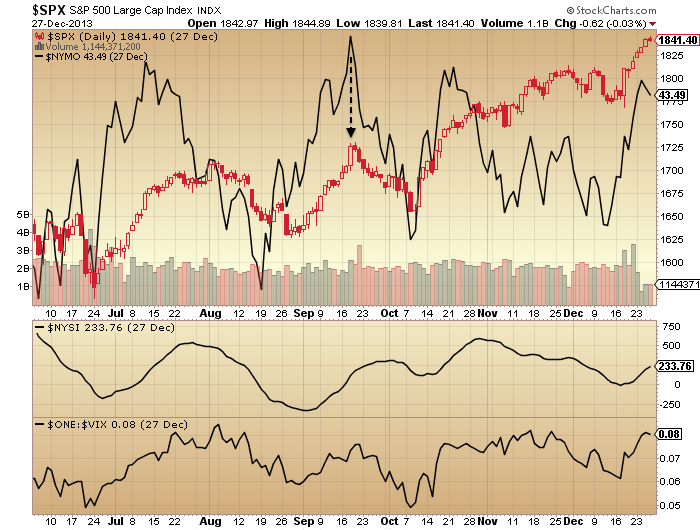 Typically this has been a smart indicator, diverging before important peaks. The current reading is particularly low. This and other low indicators (e.g. 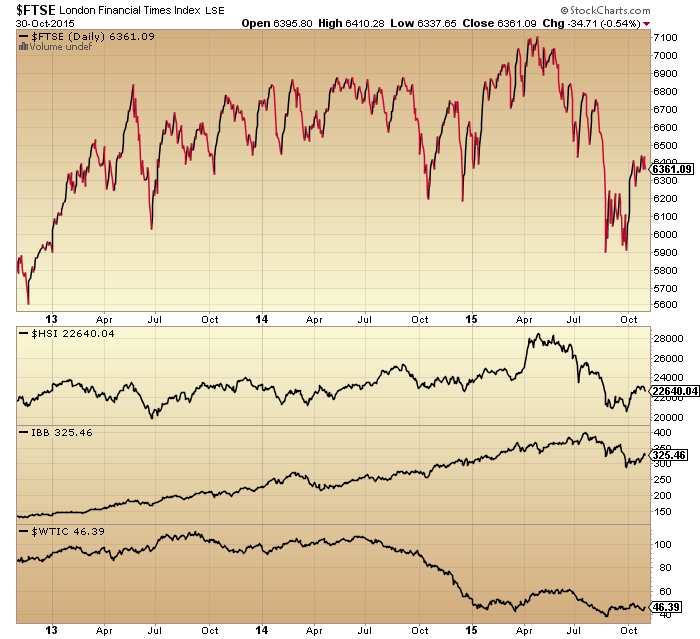 II sentiment, Rydex) are bearish unless they reverse. If they start to reverse strongly higher then they become a tailwind. And then there is gold and miners. A relief rally was due once bullish percent was at zero again around August. But is this the start of something bigger? So, there are various tests here. If we are indeed in a bear market (my belief) then we should see (1) stocks repelled from around the 200MA (2) continued weakness in small caps, junk bonds and other riskier assets, no catch up with large caps (3) gold maintaining outperformance relative to stocks. As things stand, US earnings have exceeded expectations but expectations were low. Currently, Q3 blended earnings are -3.3%, revenue -3.9%. Q4 forecast blended earnings -1.2%, revenue -1.4%. If we take out energy then these turn positive. So that takes us back to the question of whether oil has been a leading indicator deflationary recession here, or whether low energy prices can be a tailwind. But either way, current earnings cast doubt on the renewed bull scenario. ECRI leading indicators are negative whilst Conference Board leading indicators are positive, but one key difference is that CB use the yield curve whilst ECRI doesn’t. The yield curve can’t turn negative under ZIRP so that creates some artificial levitation in the CB LEI. 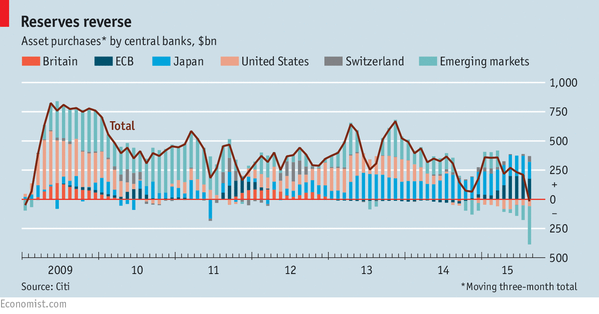 The global picture is one of a world economy on the edge. The question remains whether we are seeing an unstoppable negative feedback looping or just another soft patch, and this will become clearer as time passes. ECB dovishness and a China rate cut both produced positive market reactions – as has been the norm in the last couple of years – but neither ECB QE nor China rate cuts have worked so far and the question is whether central banks are fairly impotent in reality. More in keeping with the bearish scenario than the bull. So, can US large caps lead everything back up again, or are they the last point of strength in a succession of roll overs (oil, emerging markets, China, small caps, Biotech)? Just got to wait and see here, but we are closing on some key checkpoints. There were lots of people bearish down at the Aug and Sept lows who are now bullish at the Oct highs. Perhaps goes without saying but that’s trading the wrong way round. If you were bullish and bought around the lows, then now may be the ideal time to lighten up as we hit the 200MA and the overhead supply zone. If you side with indicators of a bear market then now is perhaps the ideal price area to be adding or entering short. Turning long from short here or building long at this point is rather unlikely to bear fruit. Never investment advice of course, but we all see these common errors made as people are sucked into the waves of sentiment. I maintain the likelihood is of a pullback next (historical analogs, RSI divergence, overhead supply and 200MA), from which point the bull/bear balance should start to tip decisively one way. Bulls still have the ball at the moment, but we remain neither confirmed in bear nor bull market so need to keep teasing out the clues. One that got some coverage this week: two all time record high prints in the Skew (protection against an outsized move). The 8DMA of the Skew shows reasonable odds that turns out to be a top in stocks on a longer term view. Next we see the long sagging breadth in the SP500 is similar to 2007-8. From the recent low in breadth a bear market rally is in keeping but ought to fail by the 200MA, shown circled in both instances, if this is indeed a bear. 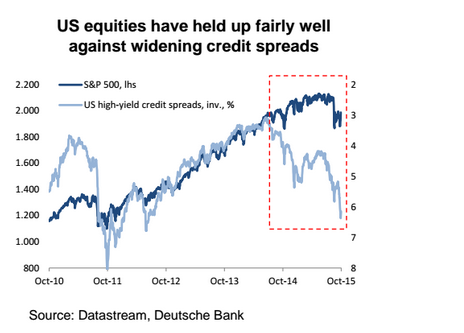 Credit spreads are a negative divergence. Like breadth they have fallen some way and some time already. Ditto oil. So take your pick: either all these things have washed out and yet stocks have held up bullishly, or, like in 2007-8, markets have rolled over gradually (back then: real estate, developed stocks, emerging stocks, and lastly commodities) with developed equities now the last this time to complete the bear. Turning to the US economy, services are generally doing fine, whilst manufacturing is at recession levels. Various overall indicators, net of oil and dollar, are doing fine, but again the question is whether oil and dollar are flagging creeping disease or whether they are more isolated troubles. Here we see how overall US economic indicators are weaker than at previous tightening cycle commencements, perhaps providing the justification for staying at ZIRP, but either way telling the story of a very delicate economy. World trade is negative and central banks have notably recently been having to draw on reserves, something we haven’t seen since the last recession. 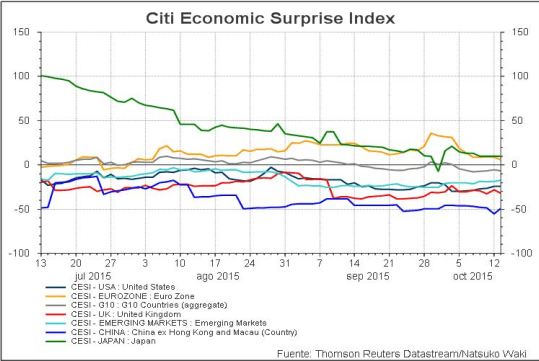 Economic surprises are overall increasingly negative around the world. Has the world entered an unstoppable cycle of negative feedback looping? That’s what I see is happening and it befits the period post solar maximum. 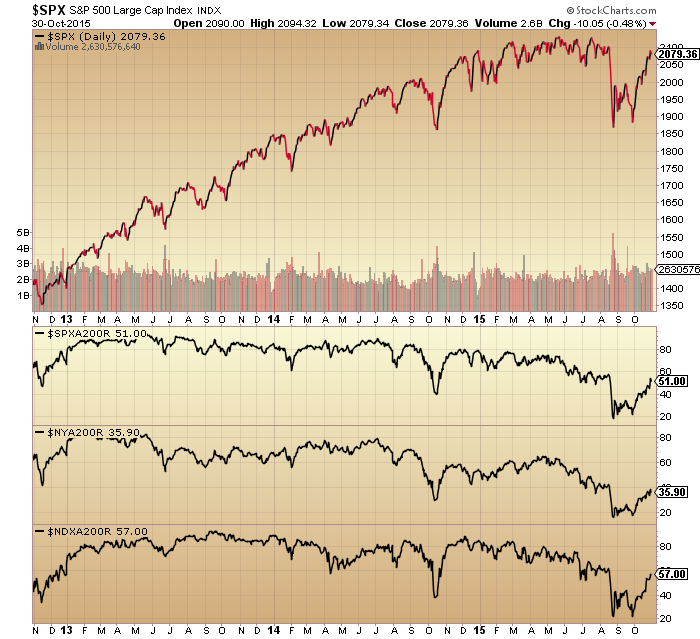 But it comes back to the stock market: equities typically lead the economy and for much of 2014 and 2015 the levitating market prevented the weak economy from tipping over the edge, due to the wealth effect. The 10% drop in stocks in August was therefore a major blow, but, having partially retraced, what’s happens next is key. Here we can see that other major stock markets are in a more bearish position than US stocks. And here we see that US small caps and mania-leader Biotech are under-performing large caps, whilst gold has notably taken off (and rallied despite a pullback in oil this week). This all adds weight to the likelihood of this being a bear market rally, with US large caps the last area of strength to break decisively. My positions are the same. I am looking for stocks to arch over again this week or by 200MA / November at the highest / latest. However, even if this were to ultimately resume bullishly, this kind of technical price pattern historically has seen a pullback in prices from here to create a third but higher low. So if stocks do start to fall back again it still won’t be true bearish confirmation and both bullish and bearish alternatives will likely remain in play for a while longer yet. Thus, I will rather look to leading action from the likes of gold (ideally continued strength) and Biotech (ideally breaks downwards again to reveal recent stabilisation as a bear flag), plus some leading economic indicators and credit. And then there’s earnings. Earnings got properly underway last week but plenty more big ones to come over the next couple of weeks. Thus far the earnings growth is a blended -4.6% and the revenue growth a blended -3.2% from a year ago. Given US equities are still highly overvalued historically it’s going to take some big beats for this not to weigh negative on the market. Well, is it a bear market rally or a bull market rally? 20 months after topping indicators started flagging we still can’t say for sure. 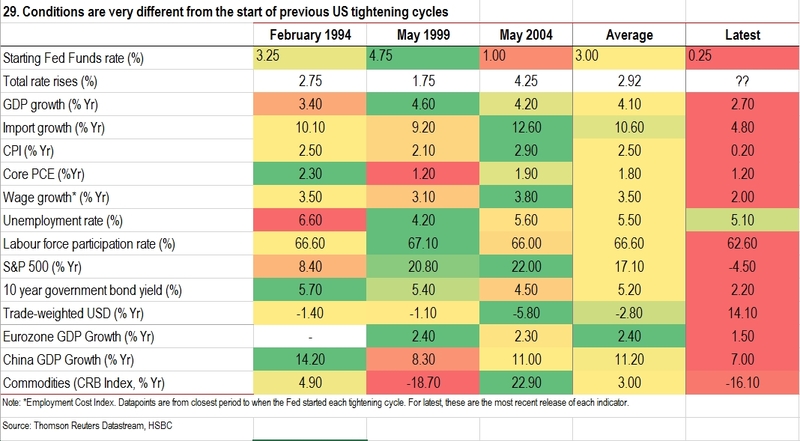 That sounds incredible, but before the 1929 top the first topping indicators flagged from May 1928 onwards, and before the 2000 top the first topping indicators flagged from July 1998 onwards. So long difficult tops can and do occur. The previous 2 years rally in US stock indices was made up of less than 20% earnings growth and more than 80% multiple expansion. The last 2 such occurrences in history were 1985:1986 (leading into 1987 crash) and 1997:1998 (leading into 1999 real Dow peak). Compound annual growth rate in equities since 2009 was only exceeded in 1929, 1937, 1987 and 2000, all of which led to steep market declines. Valuations (aggregating various measures) were the third highest in history after the 2000 and 1929 peaks. Russell 2000 reached trailing p/e ratio 88; Amazon trailing p/e 1440; Facebook trailing p/e 148; Twitter reached $40bn market cap with zero profits. Declining breadth in the number of countries participating in world equities rally. Cluster of extreme Skew readings not seen since June 1990 before recession began July 1990. Investor Intelligence percentage bears and bull-bear spread were both at 1987 levels (market crash). NAAIM survey sentiment was in the 98th percentile = extreme optimism. US household exposure to equities had risen to the same levels as the 2007 top. 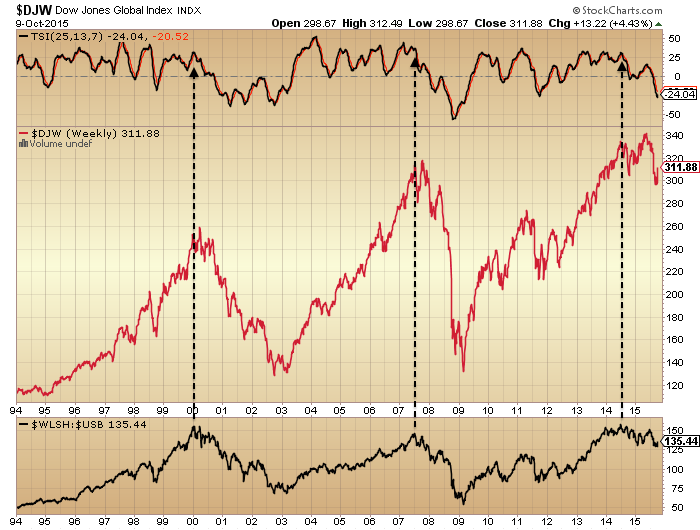 Fund manager allocation to global equities at levels that previously led to a market peak or correction. 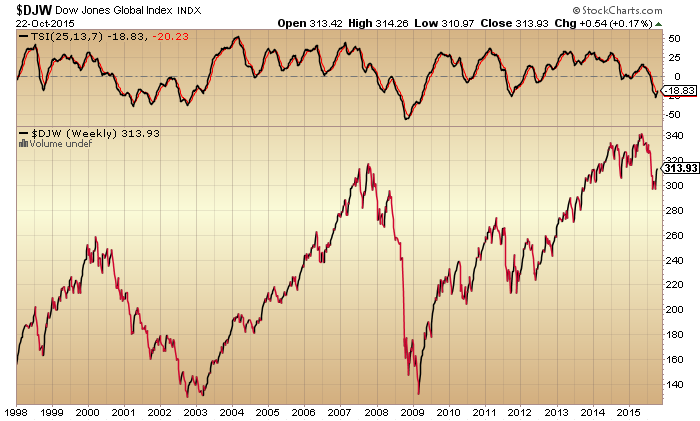 Rydex bull-bear and levergaged bull-bear ratios at an all-time record. 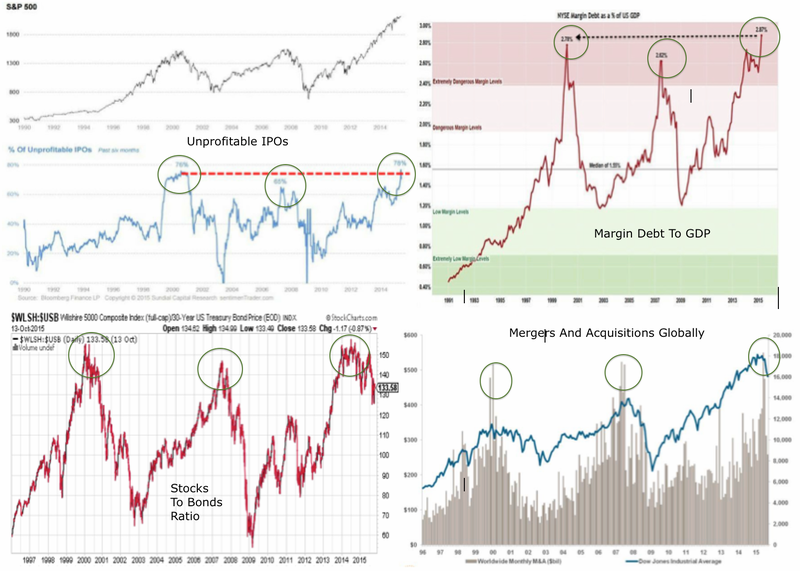 Margin Debt had escalated to 2.5% of GDP, only exceeded at the 2000 market peak. And the list did’t stop there. But, we can unify these varied measures and indicators as (1) evidence of an unsustainable mania and (2) divergences in breadth and risk appetite. The first warned us of a coming peak and the second of a peak in progress. At the time solar scientists believed the solar max was already through, but this didn’t turn out to the case until mid 2014. 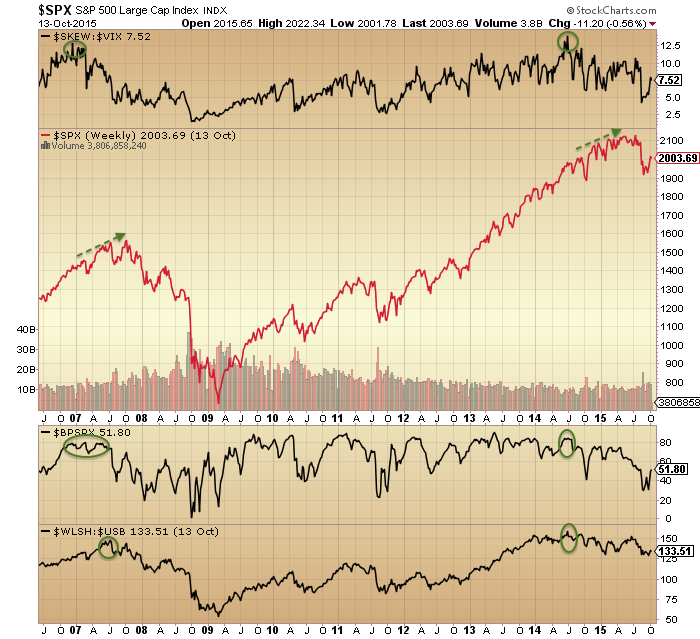 Fitting in with this, at mid-2014 the bulk of other negative divergence topping indicators formed. We saw a similar bulk-flagging in Jan-Mar 2000 (before the August final roll over) and in June-July 2007 (before the October final roll over). Here we see high beta to stocks, stocks to bonds, stocks to dollar and junk bonds as examples of that under-the-hood mid 2014 peak. Shortly afterwards geomagnetism started to ramp up as is common post solar maximum and weighs negative on the market. 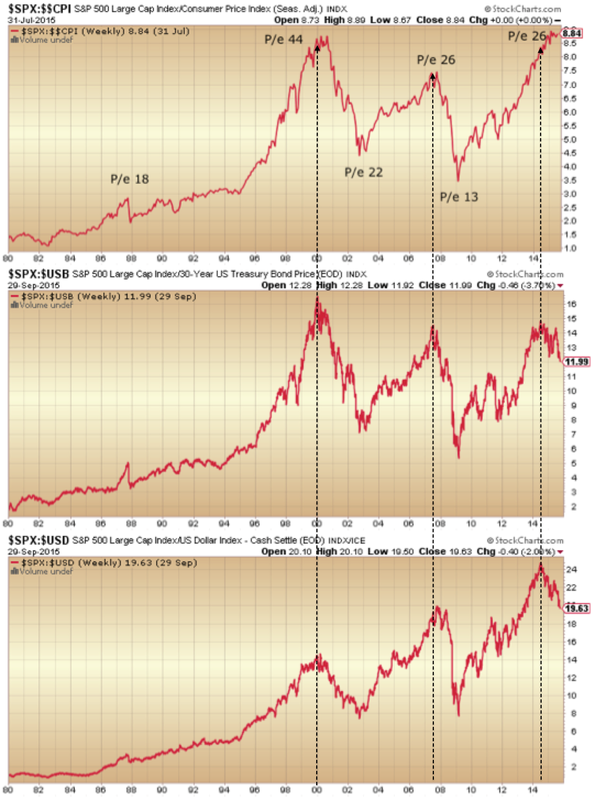 All four charts so far in this post show the same thing: peaks in the past and downtrends in place ever since. This aids our conviction for a bear market in progress. There has been an intensification of storms since around February this year, after which the market struggled to make any further gains. The latest spike down was right at the end of last week, meanwhile sunspots have dropped to close to zero, so for now solar influences are very much aligned for a bear market. By the recent stock market low of late September, capitulative breadth, contrarian put call and sentiment readings had formed, out of which the market has made a sharp rally upwards to the current point. Bear market rallies are typically fast and furious so the strength doesn’t provide decisive confirmation of bull or bear. The Zweig breadth thrust flagged at the recent low, and history shows that these have been potent rally initiators in bull markets but overall poor in bear markets. So again, that doesn’t particularly help us here. Also, insider buying flagged at the recent low, but again, history shows us that this group is a dip buyer at both bull market correction bottoms and bear market pauses, so wise enough to be buying after falls but not wise enough to differentiate between a bull correction and a bear market. 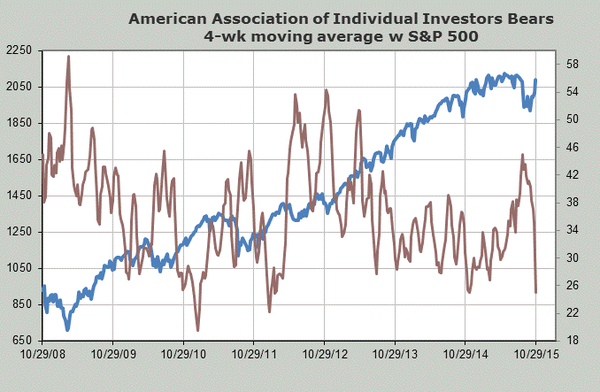 Fairly consistently they initiated a pullback in stocks either to the day or within a couple of days. At the start of this coming week we have the new moon and US earnings get going, so that, together with the very recent geomagnetism could help trigger the fresh reversal. But what then? One is we reach up to the 200MA then are repelled back into the bear market. The other, and my favoured option, is we pull back lower, then make a lower high, then resume downwards. Chris Carolan merges previous similar solar lunar years from the past and creates a model. I don’t know how successful this is but the method appeals. It might fit with my favoured scenario of pullback, rally back up to lower high, then down again properly as of November. October is typically the worst point seasonally geomagnetically, from which pressure then eases. Plus earnings may collectively surprise worse or better. These are two wildcards for the rest of this month. ECRI leading indicators are still negative but maybe forming a higher low, whilst narrow money leading indicators for the US suggest weakness over the next several months. 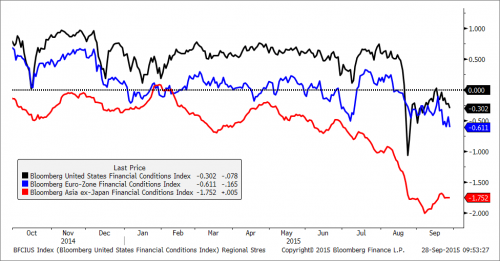 Financial conditions in US, Europe and Asia are united negative. Biotech, the mania leader, and my biggest short, has only managed so far to make a bear flag down at the lows, post parabolic break. Gold and miners, my only longs, have taken off this last week, but as yet we can’t differentiate them from the bullish break upwards in oil (whether they are acting as safe havens or commodities). 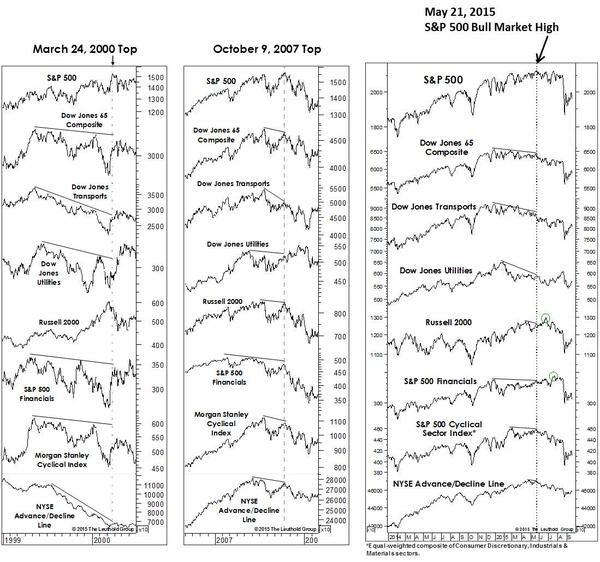 And Leuthold provide a nice summary of matching divergences in the US into the May 2015 peak to the 2000 and 2007 peaks. A recap of the big picture. In 2014 around 40 stocks bull market top indicators gathered. The list includes valuations, leverage, allocations, sentiment, money losing IPOs, buybacks, breadth and risk divergences. Collectively, they depict what we just experienced as the second biggest mania of all time. Here is the SP500 price to sales ratio reaching a record in 2015. Now understand that the Nasdaq price to sales ratio escalated to 6 at the 2000 peak but the Biotech (poster boy for this mania) price to sales ratio reached 10 at the 2015 top. The caveat to all the above is that conditions are historically anomalous: low inflation, falling commodity prices, ultra low interest rates and QE. Nonetheless, conditions were indeed similar to this in 30s US and 90s Japan and tellingly both bear markets and recessions occurred, i.e. stocks did not need ‘repricing’ or otherwise recalculating. Add in the solar max for timing and we can see that under the hood multiple financial and economic indicators peaked out mid 2014 along with the solar reversal, adding to the likelihood that we are now in a bear market and heading into a recession. The mania burst in August, with a fairly vertical 10% price drop. 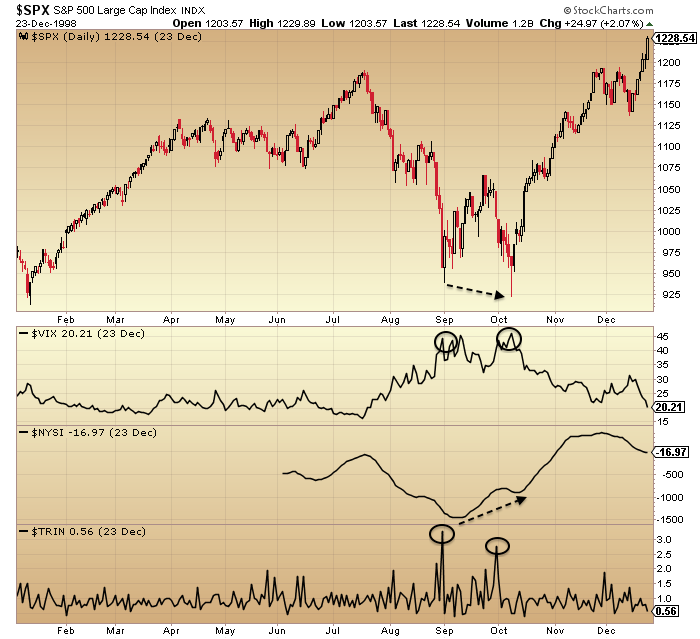 Certain indicators that had been stuck at extreme bullish (contrarian bearish) fell sharply to low levels. These include sentiment surveys, put call ratios and inverted volatility. Based on the new readings in these indicators, some analysts are calling for a price bottom and bull market resumption. However, be aware that certain other indicators such as valuation, leverage and household allocations are still very high and a long way from mean reversion. Many depict what we are going through as similar to 1998 or 2011. So here are the charts. In both instances price made a lower low on a second capitulation reading before taking off again. Bringing us right up to date, the price reversal of this last week did not occur from a similar high volume high fear secondary low, which may mean a lower low is still ahead. As an example of that partial case only, here is bullish percent to call out showing a suitable washout but volatility to stocks not there. The arrow denotes a possible analog. The sharp declines and post sharp declines stabilisation are similar, followed by a couple of days rally into the arrow that then failed. Should last week’s price recovery instead be built upon next week and through October, then we may be looking at a slower bear market initiation, whereby we perhaps head back up towards the 200MA like in early 2001 or 2008 before rolling over again. At this point I give negligible odds of the market resuming in a bull market and making new highs. Understand that we saw max saturation in terms of allocations, leverage and buybacks, whilst we have negative demographic trends in the major nations meaning a shrinking buyer pool. For prices to rally to new highs from here we would need to see allocations and leverage break to new collective records. 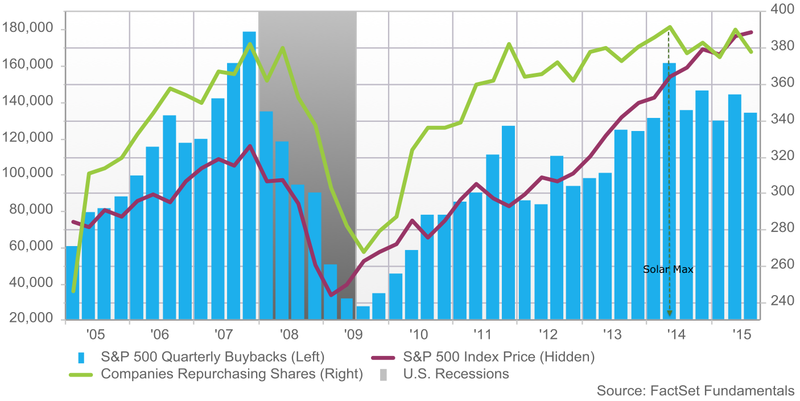 The bursting of the mania that we just saw makes this very unlikely, plus buybacks peaked back with the solar max. On the flip side of equities, gold and miners have been either basing or languishing: which one is yet unclear. Yesterday may have been a key day as they both rallied on the poor jobs number and did not then reverse, unlike equities. So, we see how they develop next week too. Earnings season kicks off again this next week. Short Biotech – I see the mania as burst, the parabolic broken and the second chance done. Therefore, I expect hard and fast falls to resume here promptly. Short R2K – the R2K reached its highest ever valuation at this peak and history suggests small caps should retrace their full gains under a bear. Short Dow – more likely to hold up than the others but a lower high or sideways range trade are the most bullish outcomes that I can conceive. Long Gold – has been unnervingly weak but I continue to believe it must be the beneficiary once stocks are more clearly cemented in a bear. 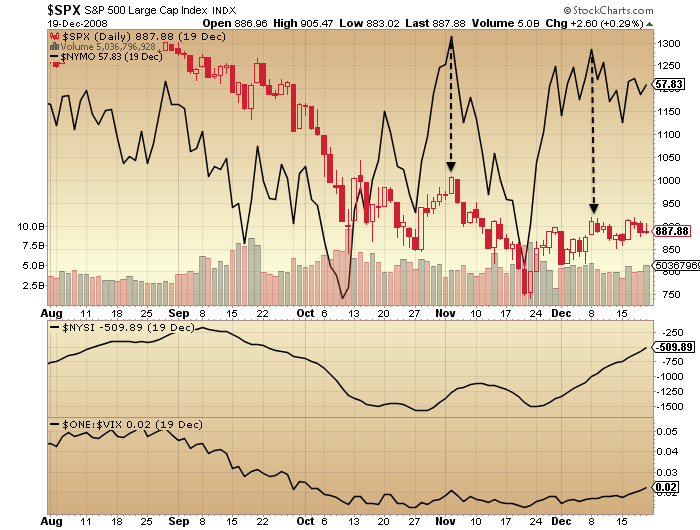 Long gold miners – new position as indicators depict washed out and positive divergence. A position on which I will rigidly use stops, however, due to uncertainty as to how this asset performs if stocks break lower.